chawli bhaji is a simple dry preparation or sabzi made with long beans, spices, coconut and chana dal. first rinse 2 tbsp chana dal in water for a few times and then soak them in 1/3 cup hot for 30 minutes. later drain the water and keep the chana dal aside. either you can rinse the beans and then chop or chop them first and then rinse. whichever suits you. to avoid the water soluble nutrients getting rinsed in water, i first rinse the beans and then chop. slice off the top and bottom part and chop the beans in small pieces. heat 1.5 tbsp oil in a shallow frying pan. lower the flame and then add 1/2 tsp mustard seeds & 1/2 tsp cumin seeds. let the mustard seeds crackle. then add 1/3 cup chopped onion, 1 green chili (chopped) and 7 to 8 curry leaves. saute the onions on a low or medium flame till they turn translucent. add 1/4 tsp turmeric powder & a pinch of asafoetida, when the onions become translucent. stir quickly and then add the chopped long beans and the chana dal. add 1 cup water. mix very well. cover the pan with a tight fitting lid and simmer the long beans on a low to medium flame till they are cooked. 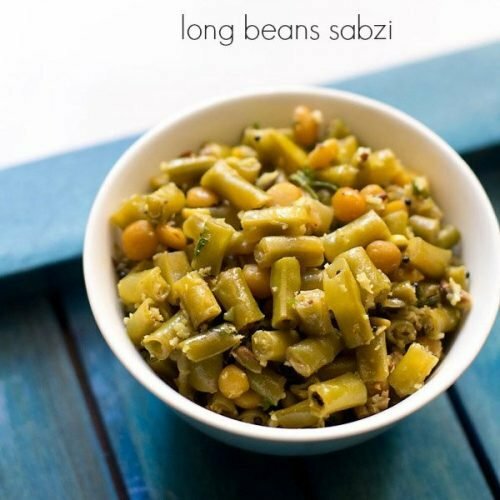 do check the chawli sabzi or bhaji at intervals to see if the beans are cooked or not and if the water has dried up. if the water has dried up and the beans or chana dal are yet to cook, then add some more water. when the long beans & chana dal are cooked well & the water has dried up in the bhaji, then add 4 to 5 tbsp fresh grated coconut. if there is any water then dry the sabzi completely, before adding coconut. mix very well and then add 3 to 4 tbsp chopped coriander leaves. stir and mix chawli bhaji again. serve chawli bhaji with chapatis or as a side dish with dal-rice. this long beans bhaji also goes very well as a side dish with sambar-rice or rasam-rice.